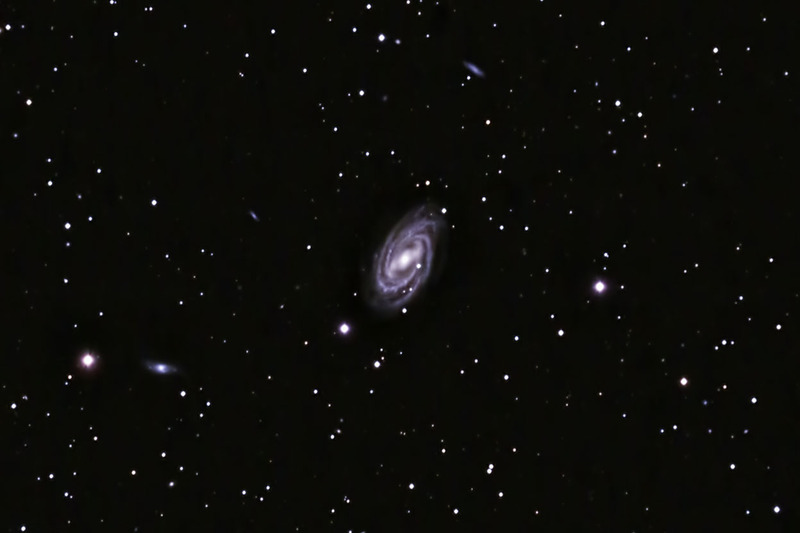 M 109 is a barred spiral galaxy in the constellation of Ursa Major - the big bear. It is a large galaxy (120,000 light years in diameter) and lies approximately 84 million light years away, making it the most distant of the Messier objects. The three satellite galaxies in the frame (counterclockwise from the top) are UGC 6969, UGC 66940, and UGC 6923. Guiding: SSAG Pro on 300mm Komura lens. Camera was focused using live view and a Bahtinov mask. Images were aligned and combined in ImagesPlus. The composite image was adjusted in Photoshop. Sharpening and noise reduction were done with Topaz Detail and DeNoise respectively. Taken from my backyard observatory in southeastern Minnesota on 4/30/16 and 5/1/16.